Okay, here’s the thing, you have abs. They’re there. Some of us just have a little more “coverage’ for them, but believe me, they’re there. And every movement and exercise we do for them makes them that much stronger and that much more toned. I don’t guarantee “perfect abs” to anyone – myself included – from any of the exercises I perform or promote. But I can nearly guarantee the sense of accomplishment and satisfaction you’ll get from completing these workouts. 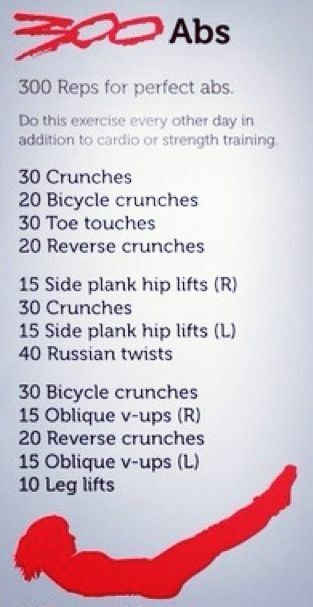 I love this workout because the exercises are pretty basic and you’ll get a great workout from them. You’ll really work your core and may feel like you want to die part-way thru but, hang in there, you’ll make it. Do these ab moves a few times a week (every other day and incorporated into your regular routine, as suggested**) as you’ll see improved strength in your core and hopefully you’ll whittle your middle at the same time. **If you’re a new exerciser and you feel this workout is enough for you, then by all means just stick with this for the first few days. Eventually you’ll build of strength and stamina and can add more to your routine.